← At San Diego Comic-Con today! 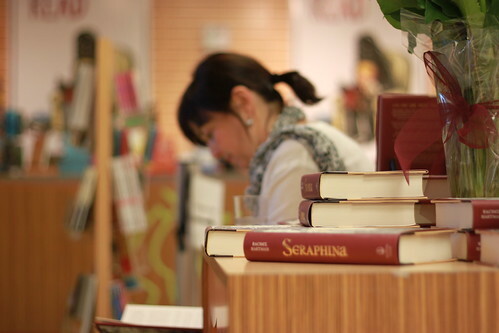 Tuesday evening we had a charming soiree at KidsBooks, a wonderful children’s bookstore here in Vancouver. It was by invitation (mostly — we had a few walk-ins too, which was awesome). I invited everyone I could think of, and was delighted with how many people came. I even had friends come up from Seattle and Vancouver, WA! The first forty-five minutes or so were spent greeting people. I knew pretty much everyone who came, so there were a lot of hugs. It was nice to be able to have my very first event in the company of friends. Then I did a little reading. 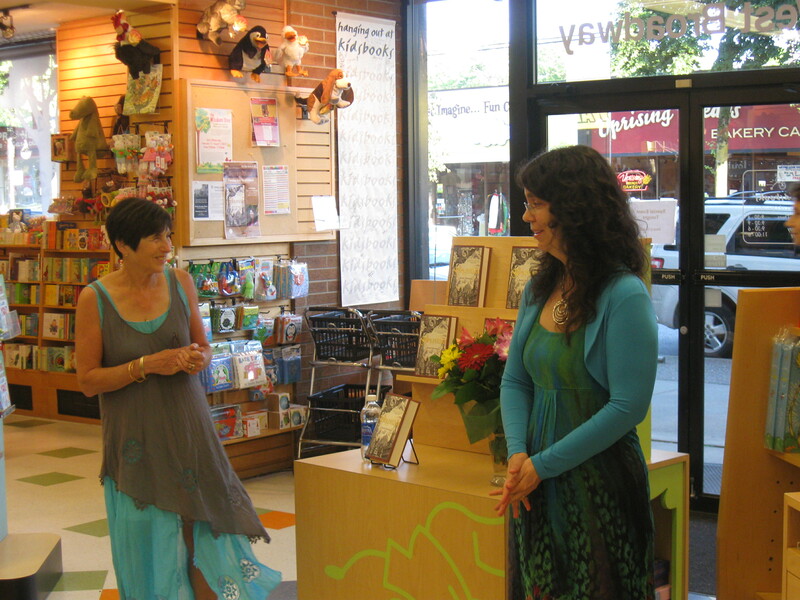 Here’s Phyllis Simon, one of the owners, introducing me. Thank you so much for your kind hospitality, Phyllis! I’m the one on the right. Thanks again to all the KidsBooks staff! 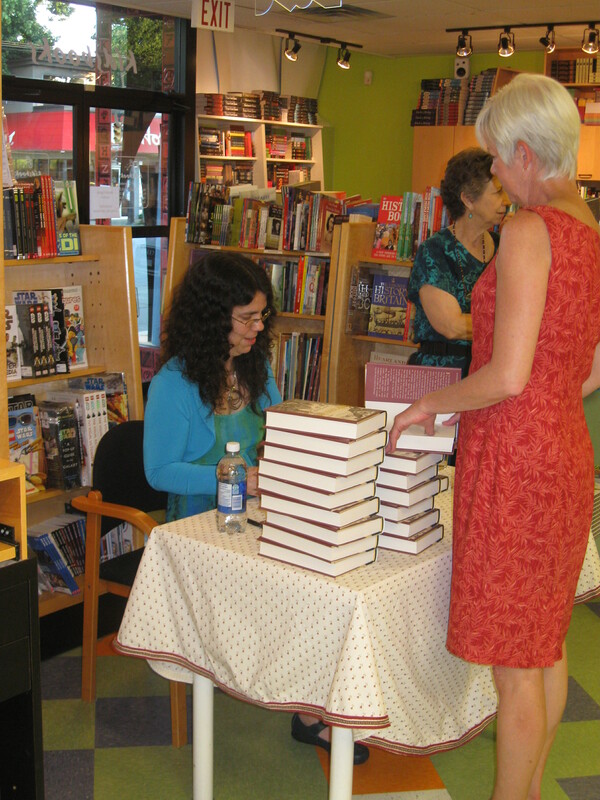 Then I signed books. 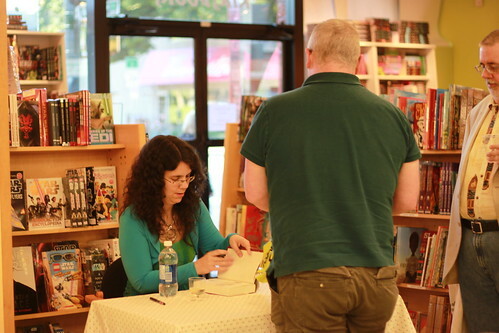 This picture is me at the very end signing stock for the store, which is less interesting, but it’s the only picture I seem to have gotten of my local Random House rep, Trish Kells, who helped arrange and coordinate the whole event. That’s her in the pink. Thanks, Trish! It was wonderful! We had this down to a science by the time we got through that pile. Here are a few more pictures from Liz, who is an excellent photographer, just to give you a little more flavour of the evening. 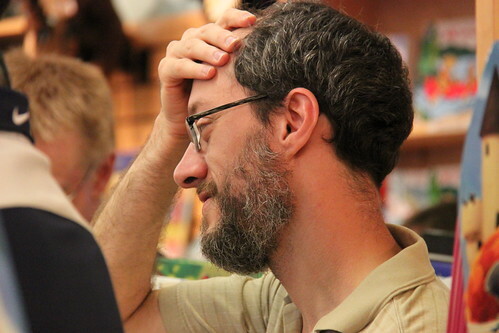 That last picture is my husband, looking tired but happy. That about sums it up for all of us at the end of the day. Ooh, those are some gorgeous pictures. Beardy husbands of the world, unite! Liz is a whiz with the camera, if I may say so. She’s the one who took that promo pic of me laughing in the shrubbery. He doesn’t just look happy. He looks proud of you. 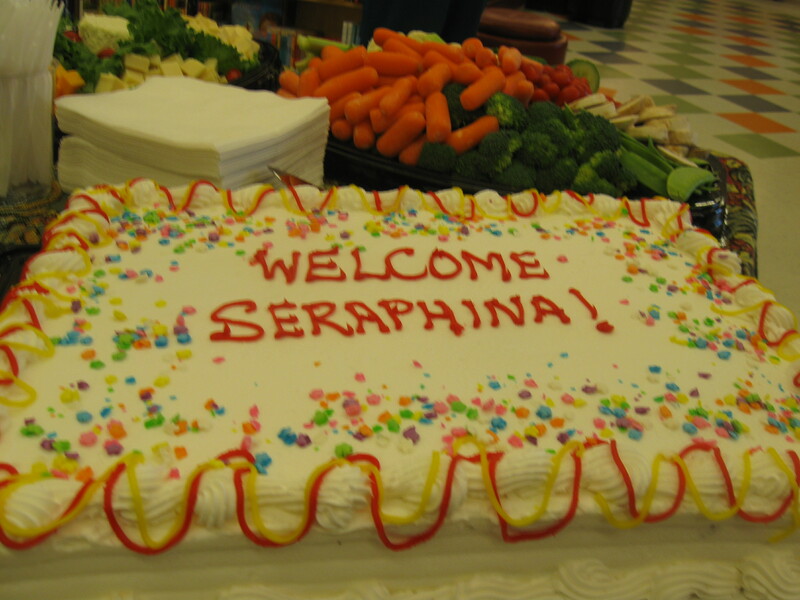 Congrats on Seraphina’s release. The cake looks delicious! I’m super excited to get the chance to read your book! It sounds fantastic! Congratulations on your debut! Yay! Sounds like a beautiful evening. We are proud to know you! Hooray! So glad it went well. You look lovely — nice outfit and nice necklace! So much to celebrate, Rachel!! Hooray! It looks like the release party was a lovely event all around. You look so good in those photos! I never knew you cleaned up that well! 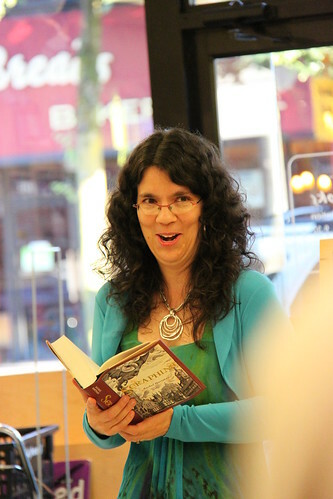 Congratulations on your book release and I am proud to be your sister! Rachel, I am so excited to read Seraphina! I’ve been following your progress by way of your mom. I am ordering 3 copies to share with grandkids. You look terrific in the photos. I love your outfit and your expressions. Muffie told me all about the signing and how wonderful it was. She said the store was beautiful. Thank you so much for signing two books for my grandchildren. Congratulations on such exciting success. Aw thanks, Peggy! We all had a super fun time. I hope the grandkids enjoy the book!